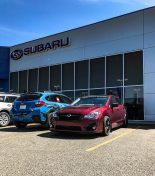 Alberta Subie's official meet is announced. It is in a very nice parking lot allowed to us by a very nice church. Please join the event to let us know if youre going or not! Also feel free to DM us on IG for any questions.